Windows 95 was where modern Windows really started and while we now look back at it with scorn to some extent, it’s important to remember that it was the first time many people were treated to the world of GUI and it’s certainly the operating system that finally killed off MS-DOS as the main operating system used on PCs. It’s probably fair to say that Windows 95 currently enjoys something of a cult status among those who are old enough to remember and use it, and there have been plenty of people managing to run the classic operating system on all kinds of modern devices. While Windows has obviously gone on to be the desktop operating system of choice for the majority of the planet, Microsoft was never able to recreate this success on mobile platforms. Between the iPhone and hundreds of Android devices, Windows Phone (Windows 10 Mobile) never stood a chance and is now consigned to the scrap heap. That doesn’t mean we cannot enjoy some of the ideas it brought to market, though, including the Modern UI with its interactive tiles. But what if you merged the best of Metro or Modern UI with the best of Windows 95? 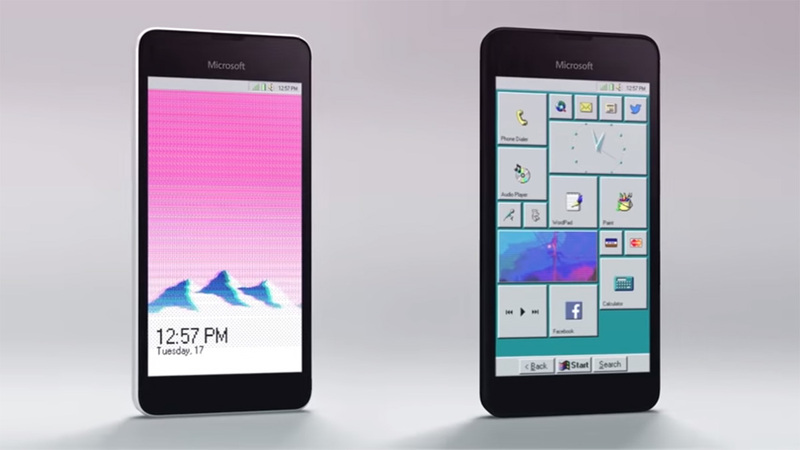 That’s what YouTuber 4096 wondered and now we have the answer after the creation of a concept showing Windows Phone, complete with tiles, but with the instantly recognisable Windows 95 aesthetic. If this thing was a real, shipping smartphone, I think I would have to buy it and it would probably be my favorite purchase of the year, too. Check the video out for yourselves and marvel at all of the gray shadows and, of course, iconic Start button. We miss you, Windows 95. Pay attention to the tweets, videos, messages etc on the phone. Hilarious! The Bill & Steve dancing bit was gold.